Our philosophy is to make a design to suit customer requirements, covering all your needs, offering the best solution for the project, from management of resources to the meticulous attention to detail, and coordinating all phases of implementation. 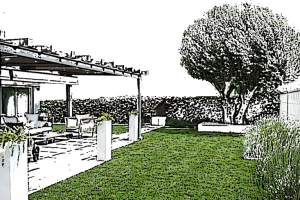 The different intervention scales that we work go from large gardens to small terraces in the private garden through public and community spaces: Pools and ponds, pergolas and porches, natural and artificial decking, barbecues, outdoor storage, natural and artificial lawns, terraces, courtyards and balconies, outdoor furniture and decoration, pavements and gravels, everything you need for your outdoor space … ah !! And the whole palette of vegetable species that Nature offers us! We place special emphasis on the most appropriate plant selection for the weather and place and more rooted in the culture of the territory, always in dialogue with the materials and elements that structure the space. We see the landscape as a factor of quality of life, both aesthetically and environmentally, as a cultural and historical heritage that binds us about identity values. Our motivation stems from the responsibility to preserve and improve the conditions of our territory for future generations, satisfying human needs on a balance of nature-economic sustainability.